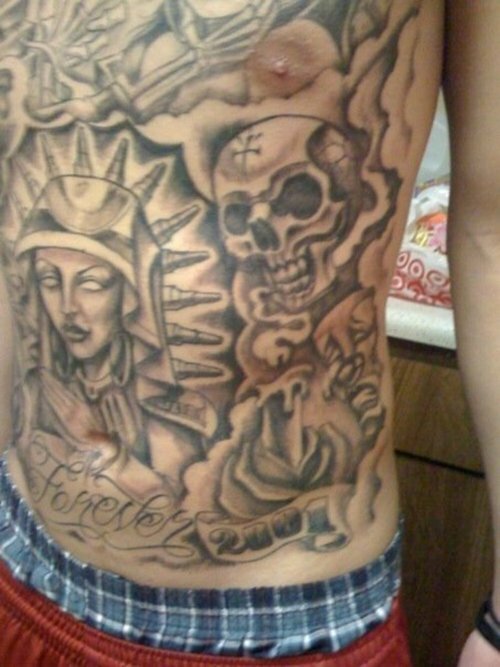 Skull tattoos have a various symbolic interpretations. It is a universal symbol that can be adapted to literally any meaning, from religious to political to simply a creative design with aesthetic merit. Skull tattoo designs come in all shapes and sizes and some are unexpectedly beautiful. Another reason for its popularity is that its dramatic lines lend themselves well to art, and it includes tattoo art. CUSTOM SKULL DESIGN have become so popular that the art behind them has evolved notably. For women, a popular skull design is a pink skull with a bow pierced on top. GRIM REAPER DESIGN have been used a lot in medieval art to remind us that life is infinite and that there is life after death. It does not affiliate with Satan, as some people believe he is the symbol for death. SUGAR SKULL DESIGN- This is often used to honor someone dear who died. The tattoo can be a symbol of mourning as well as celebration of life. This tattoo is popular with women because of the skull and color blending. BULL AND DEAR SKULL DESIGN- There is a number of animals' skull that also makes interesting tattoo designs. Bull skull tattoos represent their own style and the area that they love. The tattoo features the skull and prominently displayed horns, sometimes combined with a feather. Deer skull tattoos are popular to those who enjoy hunting; this can be antlers, though the antlers are the best way to display the type of animal skull. SKULL AND CROSSBONES DESIGN - One of the best known skull design. On a tattoo, the skulls and crossbones are on its original form, with the image on a black flag. The said design is also recognized worldwide as a symbol for poison. Men chose this design because they correlate it with masculinity. However, it has other meaning than that concept. This design represents change, particularly great change in life because skulls are associated with death, a reminder that death happens to everyone. There are some common associations with these tattoos, one must think about those meaning before you get your tattoo. Do not get it because it represents change you must think that many people are going to read it, as you are dangerous. That however should not stop you from getting a design like skull tattoo. Tattoos are very personal experience, choice, and one that is also private.